Kaguya-hime returning to the Moon in The Tale of the Bamboo Cutter (c. 1650). Cosmic pluralism, the assumption that there are many inhabited worlds beyond the human sphere predates modernity and the development of the heliocentric model and is common in mythologies worldwide. The 2nd century writer of satires, Lucian, in his True History claims to have visited the moon when his ship was sent up by a fountain, which was peopled and at war with the people of the Sun over colonisation of the Morning Star. 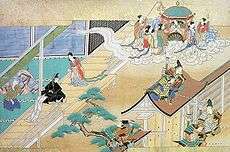 Other worlds are depicted in such early works as the 10th-century Japanese narrative, The Tale of the Bamboo Cutter, and the medieval Arabic The Adventures of Bulukiya (from the One Thousand and One Nights). The assumption of extraterrestrial life in the narrow sense (as opposed to generic cosmic pluralism) becomes possible with the development of the heliocentric understanding of the solar system, and later the understanding of interstellar space, during the Early Modern period, and the topic was popular in the literature of the 17th and 18th century. 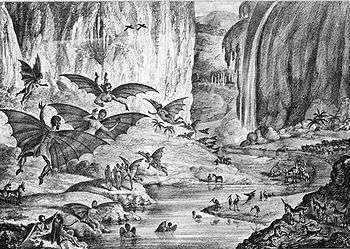 In Johannes Kepler's Somnium, published in 1634, the character Duracotus is transported to the moon by demons. Even if much of the story is fantasy, the scientific facts about the moon and how the lunar environment has shaped its non-human inhabitants are science fiction. Long hidden shapes and life, to their great Maker's praise. Fontanelle's "Conversations on the Plurality of Worlds" with its similar excursions on the possibility of extraterrestrial life, expanding rather than denying the creative sphere of a Maker, was translated into English in 1686. In "The Excursion" (1728) David Mallet exclaimed, "Ten thousand worlds blaze forth; each with his train / Of peopled worlds." In 1752 Voltaire published "Micromegas" that told of a giant that visits earth to impart knowledge and Washington Irving in his novel, A History of New York from the Beginning of the World to the End of the Dutch Dynasty, spoke of earth being visited by Lunarians. Camille Flammarion (1842-1925) who lived in a time where biological science had made further progress, made speculation about how life could have evolved on other planets in works such as La pluralité des mondes habités (The Plurality of Inhabited Worlds) (1862) and Recits de L'Infini (1872), translated as Stories of Infinity in 1873. Stories written before the genre of science fiction had found its form. 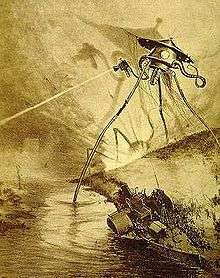 Closer to the modern age is J.-H. Rosny, who wrote the short story Les Xipéhuz (1887), about a human encounter with extraterrestrials who turns out to be a mineral life form impossible to communicate with. 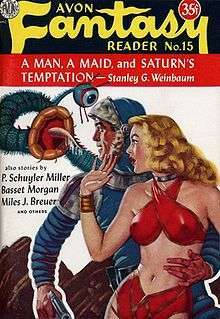 Early works posited that aliens would be identical or similar to humans, as is true of Edgar Rice Burroughs's Martians (see Mars; A Princess of Mars), with variations in skin color, size, and number of arms. ... Later writers realized that such humanoid aliens would not arise through parallel evolution and hence either avoided them or introduced the explanation of ancient races that populated the cosmos with similar beings. The notion surfaces in Ursula K. Le Guin's Hainish novels (see The Left Hand of Darkness; The Dispossessed) and was introduced to justify the humanoid aliens of Star Trek (who even intermarry and have children) in the Star Trek: The Next Generation episode "The Chase" (1993). Another common idea is aliens who closely resemble animals. ↑ Harper, Douglas. "extraterrestrial". Online Etymology Dictionary. 1 2 3 4 Westfahl, Gary (2005). "Aliens in Space". In Gary Westfahl. The Greenwood Encyclopedia of Science Fiction and Fantasy: Themes, Works, and Wonders. Vol. 1. Westport, Conn.: Greenwood Press. pp. 14–16. ISBN 0-313-32951-6. ↑ Grewell, Greg (2001). "Colonizing the Universe: Science Fictions Then, Now, and in the (Imagined) Future". Rocky Mountain Review of Language and Literature. 55 (2): 25–47. ↑ Irwin, Robert (2003). The Arabian Nights: A Companion. Tauris Parke Paperbacks. p. 204 & 209. ISBN 1-86064-983-1. ↑ Democritus (1647). Democritus Platonissans, or an Essay Upon the Infinity of Worlds. ↑ Milton, John (1667). Paradise Lost. ISBN 0-8414-2222-2. ↑ Fontenelle, Bernard le Bovier de (1686). Conversations on the Plurality of Worlds. ISBN 0-520-07171-9. ↑ Mallet, David (1728). The Excursion. ↑ Barger, Andrew (2013). Mesaerion: The Best Science Fiction Short Stories 1800-1849. USA: Bottletree Books LLC. pp. 43–44. ISBN 978-1-933747-49-1.